Whether it's an inside joke, a hidden message, or a reference to something, I love finding Easter eggs in a book. These fun and surprising gems often draw me further into the story, adding an extra layer of intrigue. 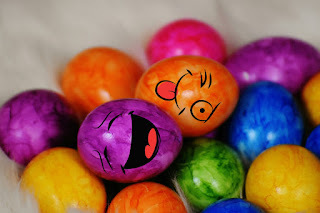 Today, I'm sharing my top three favorite places to find (or hide) Easter eggs in fiction. Characters can be one of the easiest ways to sneak in an inside joke or reference. Familiar snippets or topics pop up in dialogue. Names are anagrams for something else. A character from one story unexpectedly appears in another. All are options ripe for the picking. From businesses to fictional technology, hidden treasures can be found among the items staged in a scene. In fact, in the book I'm currently reading, the message on a half-burned sign revealed a subtle nod to its unfolding situation. What are your thoughts on Easter eggs? Do you have any favorites? I love finding and placing "Easter eggs" in books and movies. A beta-reader for one of my stories commented on enjoying finding them in my story. She found I didn't consciously realize was there! It’s interesting how things like that sneak in! I’ve found a few unintended ones before while editing.